I absolutely love the quality of this rug. What I saw online was what I received. It even arrived earlier than expected. Colors are vibrant, it gives life to our great room and after being rolled out, lays perfectly smooth and flat. I have already recommend Overstock to my friends. 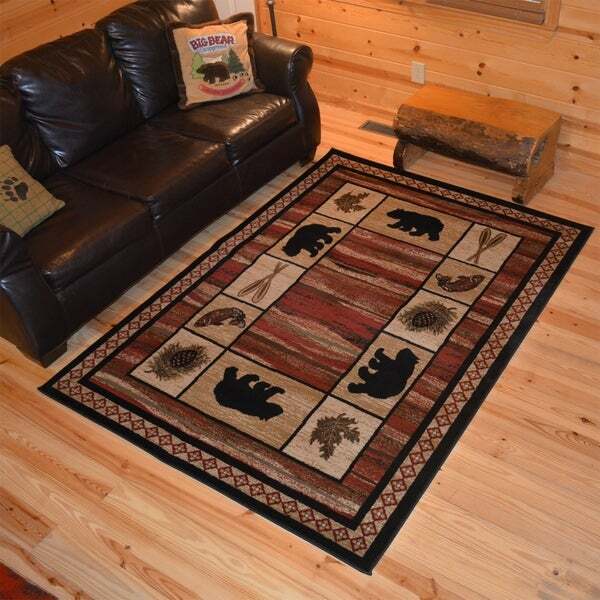 Rustic Lodge Cabin Bear Border Multi Area Rug - 3'11" x 5'3"
Rustic Lodge Cabin Bear Area Rug (3'11"x5'3") - multi - 3'11" x 5'3"
Rustic Lodge Cabin Bear Fish Deer Red Multi Area Rug - 3'11" x 5'3"
Rustic Lodge Cabin Black Bear Panel Ivory Area Rug - multi - 3'11" x 5'3"
This beautiful rug with a bear border pattern is the perfect addition to any cabin style living area. This rug features a nature themed pattern that will add a touch of charm to any space. Crafted with polypropylene, this rug is a sof and durable choice for any room. Dimensions 63.0 In. X 47.0 In. X 1.0 In. "What are the colors in this Rug? Are they more rust rather than red or cranberry?" Rustic Lodge Bear Cabin Multi Panel Black Area Rug - 3'11" x 5'3"
Rustic Lodge Cabin Panel Stripes Multi Area Rug - 3'11" x 5'3"